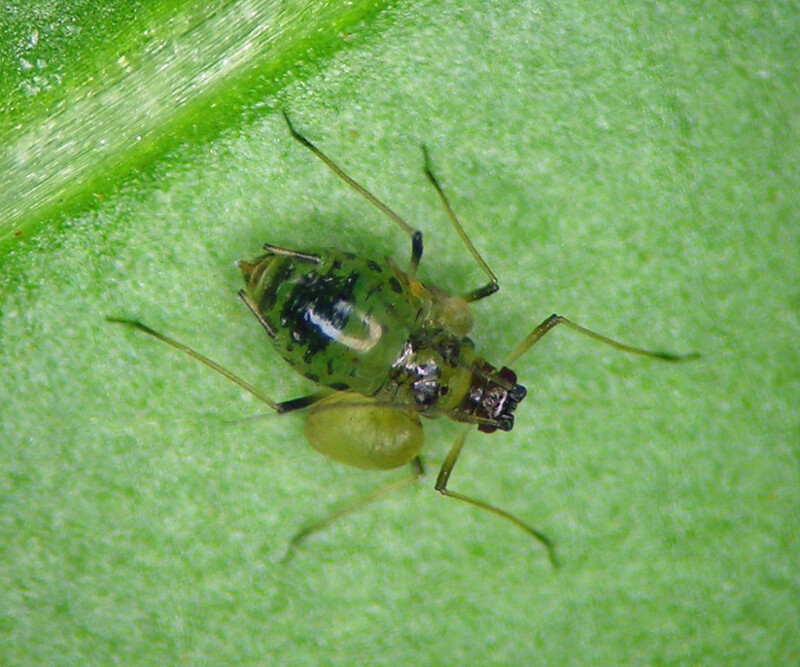 Myzus species are mostly introduced to North America from elsewhere. I have several species in my collection and all are introduced to North America, with the possible exception of Myzus cerasi, which is common in natural systems on native Prunus and Galium. This is an apparently introduced species in North America, but is one of those that make me wonder whether it in fact has a natural Holarctic distribution. Myzus cerasi on domestic cherry. 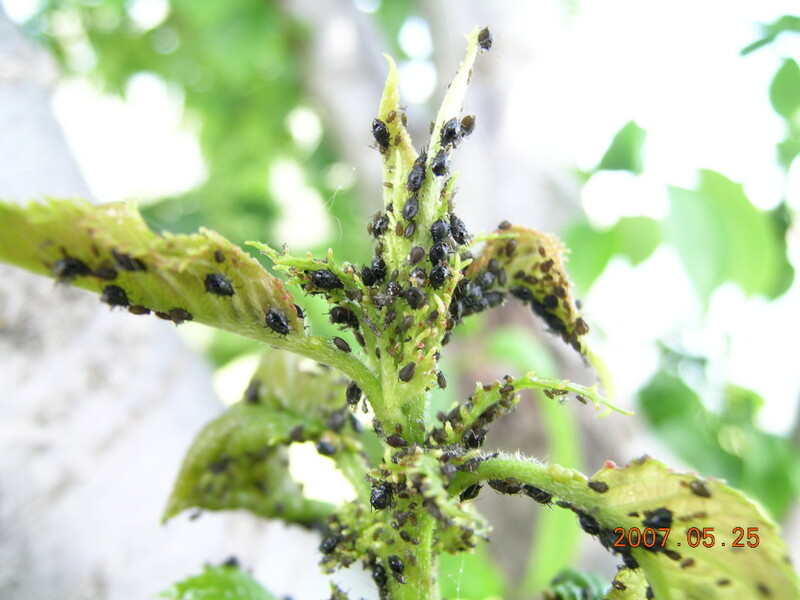 Although it is best known as the cherry black fly, or cherry aphid, it is also a common find in native undisturbed habitats feeding on both native Prunus and native Galium (the secondary host). I have few photos of it partly because it has a propensity to be very active after its host material is collected and in a jar. 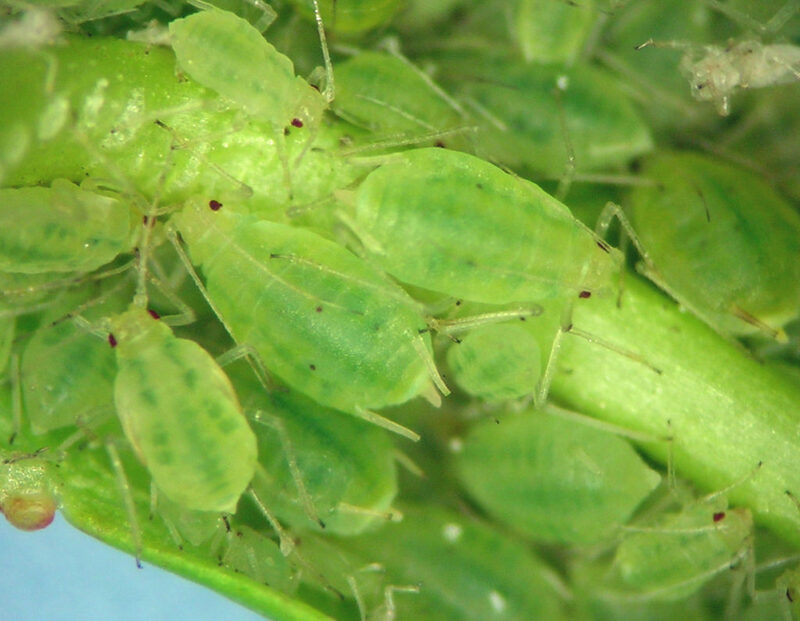 For a few years now, I have been aware of the presence in North America of another European invader, this species Myzus linariae that feeds on Dalmatian toadflax, Linaria dalmatica. Myzus linariae on its host plant, Dalmatian toadflax (Linaria dalmatica). Myzus linariae from the Salmon River in north-central Idaho. It was originally described from Central Europe where it was said to live on this plant in relatively warm and dry locations. For the past few years I have found it across the west in warm and dry locations where its host grows. So far, I know it from Washington, Oregon, Idaho, and Utah. Example localities include dry south facing slopes of the base of Mt. Timpanogos in Utah, on the shores of the Yakima River in central Washington, and along a highway in the high desert of eastern Oregon. It perfectly fits the key of Blackman and Eastop, easily separated from Myzus persicae by the longer tarsi and shorter processus terminalis. In spring of 2015 I collected some of this species along the Salmon River near White Bird, Idaho. 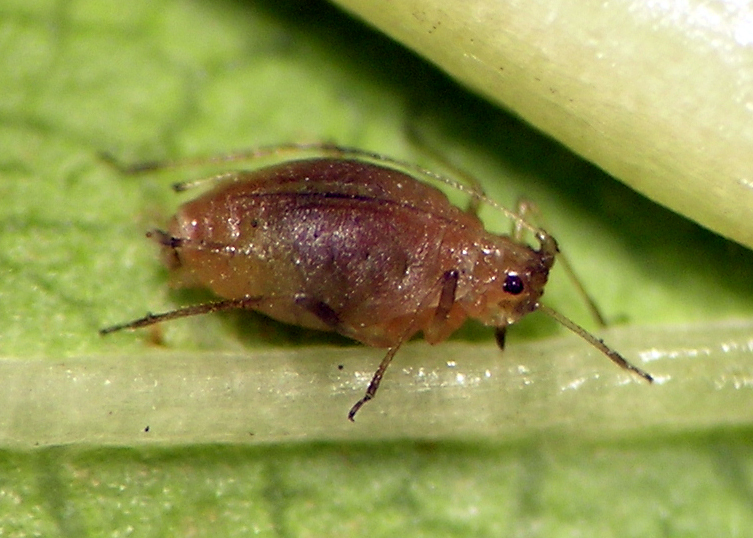 Myzus linariae, the adult being the first generation reared on cultivated pepper in our house. At home, I transferred a few specimens to a bell pepper plant purchased from a major retail store. I allowed these specimens to either live or die on the pepper for several weeks. To my surprise, they eagerly reproduced on the pepper, producing what appeared to be normal apterae. After that first generation made up of entirely apterae, the second generation was partly alate — or at least it tried to be alate. 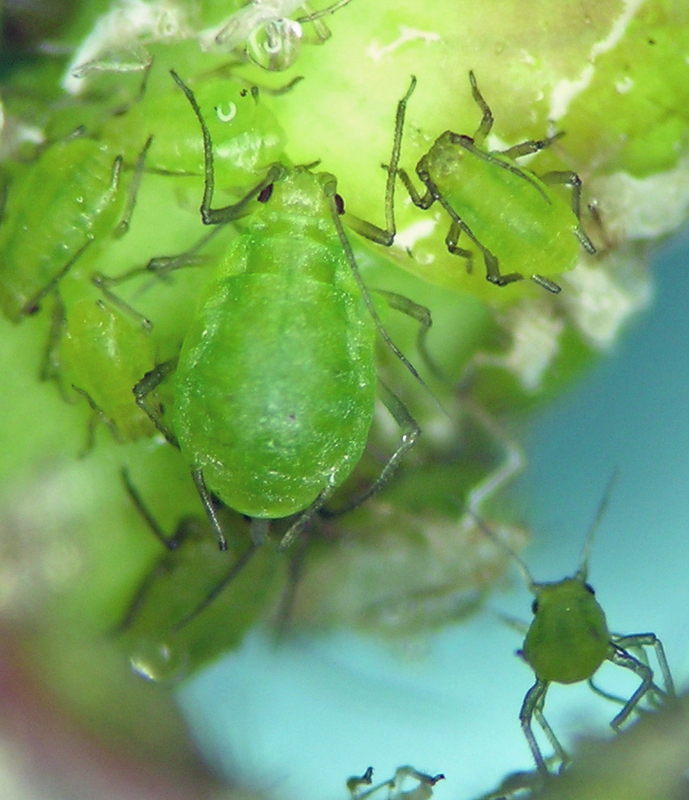 Interestingly, all the alates that matured to adult on the pepper were horrifyingly deformed as in the specimens pictured below, with the wings variously developed into fluid-filled sacs rather than wings. What do you think about that? Myzus linariae, a deformed alate that developed on pepper in our house. Although I have dealt with this aphid for almost 30 years, I confess little affection for it. My paid working life is in potato research management and I focus a bit on potato insect management. 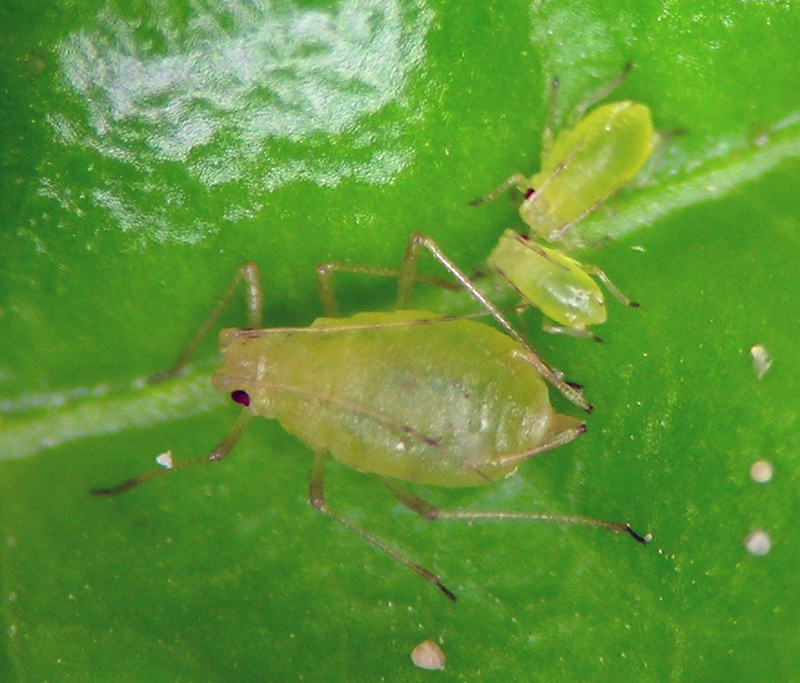 This aphid, commonly known as green peach aphid, is a major driver of pest management behavior by potato farmers in many parts of the world. I have collected and photographed this species many times in the course of my work. Myzus persicae in spring on our back yard peach tree. 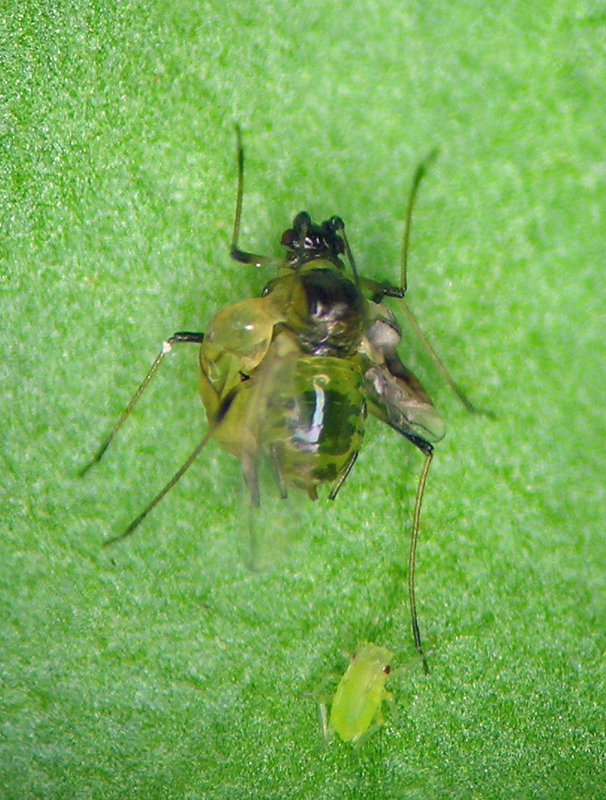 Myzus persicae aptera on the introduced Solanum dulcamara. 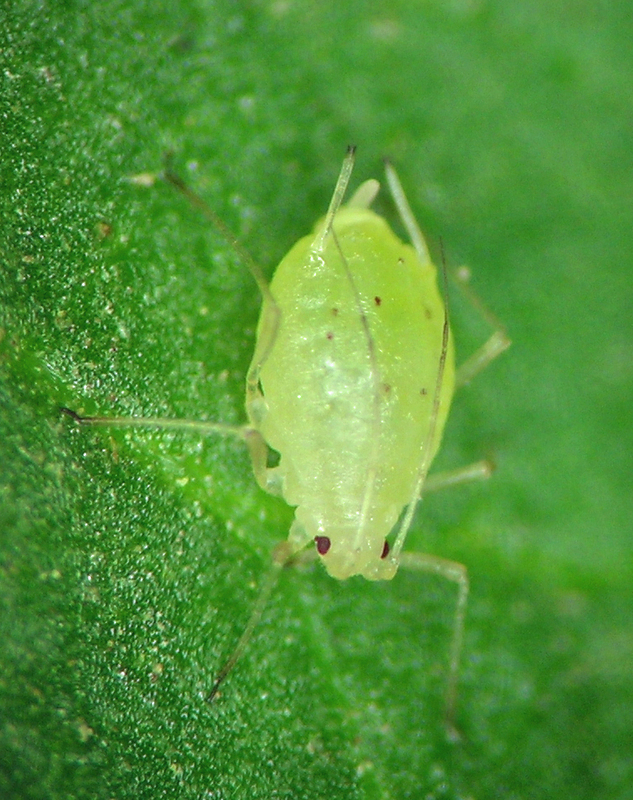 Myzus persicae alate vivipara on potato. 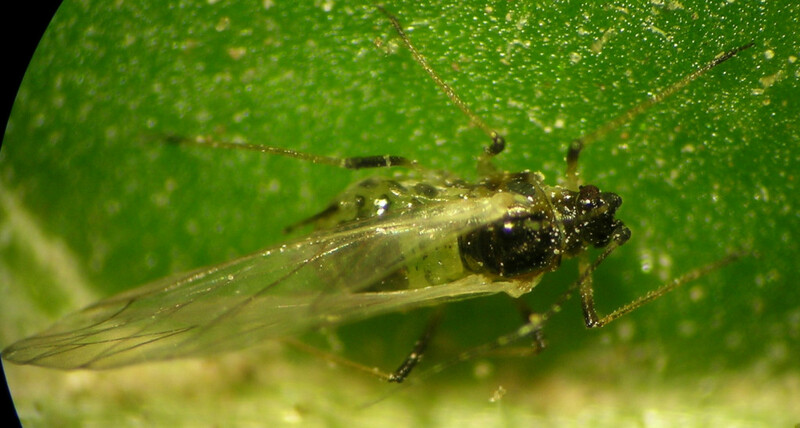 Myzus persicae ovipara on cherry in southern Washington in October.